Seemingly, under the radar because of a complete media blackout, Anonymous has launched Operation Black October. 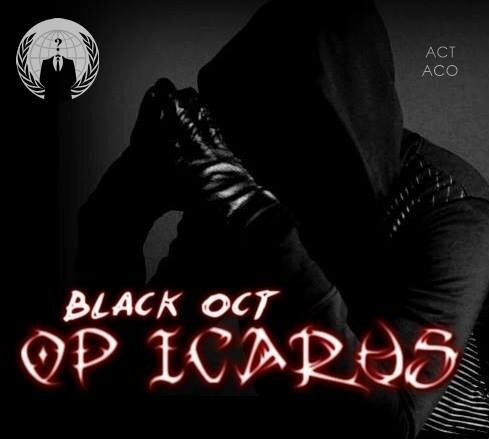 Already the Operation Black October Facebook page has received over 100K likes in 2 weeks, yet the MSM ignores Anonymous’s threat and warning to the elite that they will give them a Black October they will never forget. Anonymous has pledged to give the elite a black October that they will never forget, calling for attacks on all banks, hedge funds, and business and personal websites of elitist. The operation is code-named Black October. The international hacking collective vow to continue attacks on elitist organizations and individuals like George Soros, and whole banks alike, until the elite cease and desist their agenda of a New World Order and abandon their plans of a One World Totalitarian Government. Last June, I reported on OpIcarus Phase 2, the Anonymous operation against the Central Banks, that later evolved into targeting specific elitist, Wall St. and groups as well like Goldman Sachs and the Bilderberg Group during Phase 3. The Bilderberg Group meets once a year in complete secrecy, always in a different country, for off the record discussions from everything from politics to business ventures allowing participants to network higher into the Elite society. Attendees include tech moguls to politicians and military intelligence officials and even journalist who partake in the secret off the record private conversations. Last Bilderberg meeting, if you went to visit the infamous secrecy group’s website for the entire conference you would have received a connection error. That’s because the hacktivists targeted Bilderberg and various other targets during their annual meeting to show the elite they were watching. Anonymous has taken a stance and they aren’t going away. The Third Phase of OpIcarus was launched shortly after the second in June which was against the Stock Exchanges of the world. The Anons who talked to me additionally told me the Origins of OpIcarus were during Occupy Wall Street read more here. In a press release, Anonymous released a fight club movie referenced video with a short simple statement. The Collective has previously promised that “they aren’t going away and warn that the attacks will continue for as long as the Global Elite continue walking on their war mongering paths of greed and plot global agenda’s against the population that will ultimately lead to our own destruction. We are at the verge of nuclear threat and its becoming all the more clearer that the big international banks are now the ones behind political war starters like Clinton. Anonymous isn’t prepared to allow Wall Street and the other bankers to ignite what could possibly be the worst economic and political disaster in centuries.” OpIcarus, said. “Phase 4 is an all out cyber attack on all banks, market regulators and indeed elitists who have been trying hard to push us closer to world war 3” OpIcarus, said. 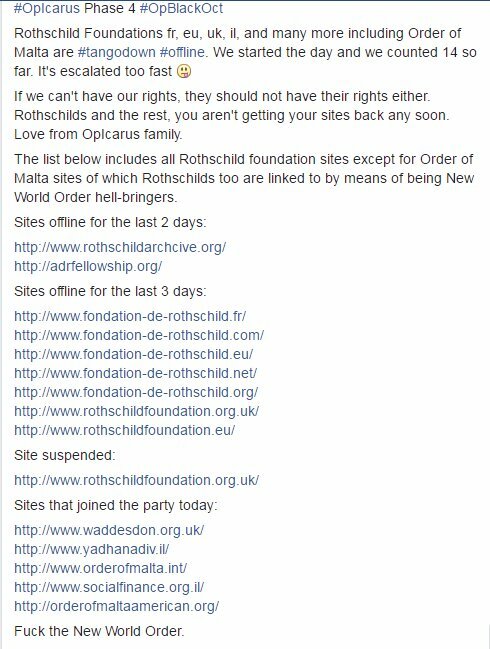 Following through with the promise of continuing an onslaught against the elite, the group later in the week (last week) sent me a follow up posting a screenshot of a pastebin with targets like the Rothschild’s, Knights Of Malta, and other elitist groups. Then provided me with screenshots of DDOS attacks on those targets. My full interview with OpIcarus and Screenshots they provided to me are below. Anonymous has declared total cyber war against the elite. Trick or treat?